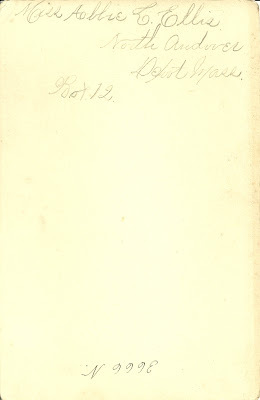 Photograph of a sad-faced young woman identified on reverse as Miss Abbie L. Ellis, North Andover Depot, Massachusetts, Box 12. The photograph was taken by the W. Allen studio of Bicknell's Block, 467 Essex Street, Lawrence, Massachusetts. Abbie Lilla Ellis was born 3 March 1867 at Andover, Massachusetts, the daughter of Arno Parker Ellis and his wife Ann Sutcliff (Sutcliffe) of Andover, born in Andover and Rochdale, Lancashire, England, respectively. Her paternal grandparents were Arno Lewis Ellis and wife Susannah (Parker) Ellis. According to Ann Sutciff's marriage record, her father was Joshua Sutcliff. 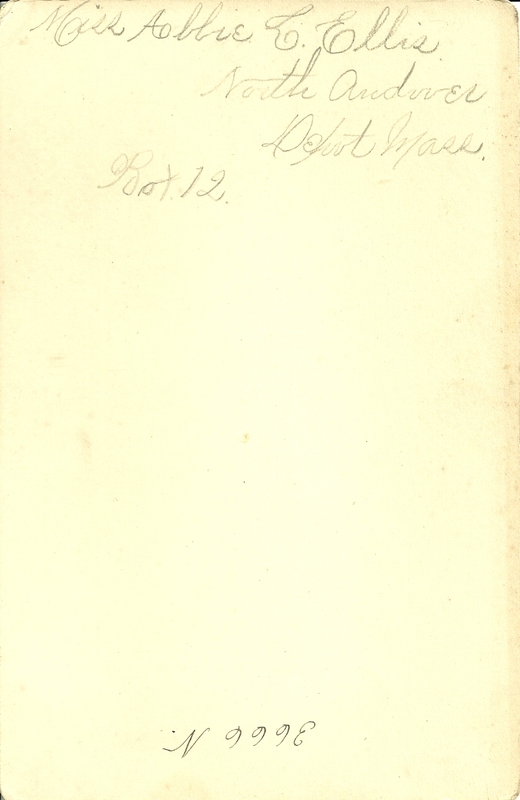 Interestingly, I found a death record for a Joshua Sutcliff at Lowell, Massachusetts, not far from Andover or Methuen. He was described as a manufacturer from England. He died of cholera on 19 September 1846, which was two years after his daughter Ann married Arno Parker Ellis. He could be the same Joshua Sutcliff who was in the 1840 Census of Andover, Massachusetts. Unfortunately, that Census does not list the names of other people in the household, although there were some. I'm not sure if Abbie Lilla Ellis ever married. Sadly, it appears from a cemetery transcript that she died in 1892 and is buried with her parents and some of her siblings at North Andover. Perhaps she was already unwell when the photograph was taken. I found an interesting biography of some of the Ellis family here in the book Genealogical and Personal Memoirs relating to the Families of Boston and Eastern Massachusetts by William Richard Cutter, 1908. If you have any additions, corrections or insights regarding any of the information presented here, please leave a comment or contact me directly. Thanks! She looks something of a lost soul to me. 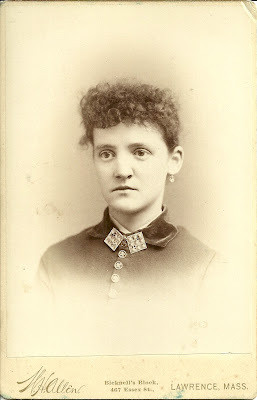 Abby is listed as single on the town death record (image available on familysearch.org), so I think you are correct that she never married. Thanks for taking the time to comment, K. It's gratifying how more and more records are coming online.